The podcast has dropped! In it you will hear MamaC speak from the heart as you would expect. I first met Shay Stewart-Bouley aka Black Girl in Maine through her writing, and presentations on antiracism and decentering whiteness. We have been on panels and symposiums together and share our stories of raising Black children in Maine, the whitest state in the country. Shay and I get raw and real on transracial open adoption, impacts of daily racism and microagressions on the boys, unpacking whiteness, and why I left my 9-5 as a newly divorced single parent. The episode explores if and why I’m qualified to do my work as an equity and inclusion facilitator in schools, and as a 20th centurty family formation coach working with individual clients. This podcast marks the true arrival of me knowing what I do best, and how I choose to share my unique and valuable experience with the world. Please consider making a contribution to support more podcasts from Black Girl in Maine Media if you like what you hear. It was indeed an honor to be invited to participate on this nationally and internationally recognized platform. I look forward to hearing your impressions after you give a listen. Keep questioning how your beliefs are serving you, and hold your littles and your loved-ones close. Introducing a new fresh look for MamaCandtheBoys. I love how aligned it feels with the new direction my life has taken. It is hard for me to express all the gratitude I feel for the many opportunities I am being invited to explore for my work in the world around race, equity, supporting 20th century families and our schools. So naturally I decided it was time for a little line up and a fresh coat of paint! Did you know there are over 1000 MamaC subscribers? I am so thankful for this growing audience each time I send out a new post. To celebrate I am running a special Premium Coaching Package for anyone who signs up by December 15th, 2018 for 2019 Coaching. I wanted my subscribers and long time readers to know about it first because the slots will go quickly. To learn more about what my coaching practice is about and the special offer please go here. The recent opportunies to work with clients has been the most exhilarating shift. It’s like my blog coming to life through deep listening, personalized support, and sharing. Bonus: for the first three new clients I register I will include a fifth session free! Imagine that. Take great care and continue to hold each other close. I am delighted to call your attention to very exciting news: my coaching and facilitation practice is now my full-time work in the world. I am here to help in real time too. A month ago I made a massive leap of faith to leave my secure and treasured position as a director of community engagement and education at a national arts organization to launch my own coaching and facilitation practice. I have never looked back. I am my own plan B! I have new clients and contracts presenting themselves at the perfect pace. The validation I feel for my choice is immensely gratifying. In addition to being able to be here when the boys (now 11 and practically 14 as Sam likes to say) arrive home and need me the most; I am living into my truest calling of the work I am meant to do. Having 15 plus years experience as a single adoptive, and biological -via a known donor- transracial parent (that’s a mouthful) I have a perspective to share. As a reader you already know that I’ve got knowledge. I bring my experience in cultivating open adoption, navigating racial awareness and whiteness, and advocating for children at all stages developmentally to my work with individual clients and groups. Are you exploring if single parenting is right for you? 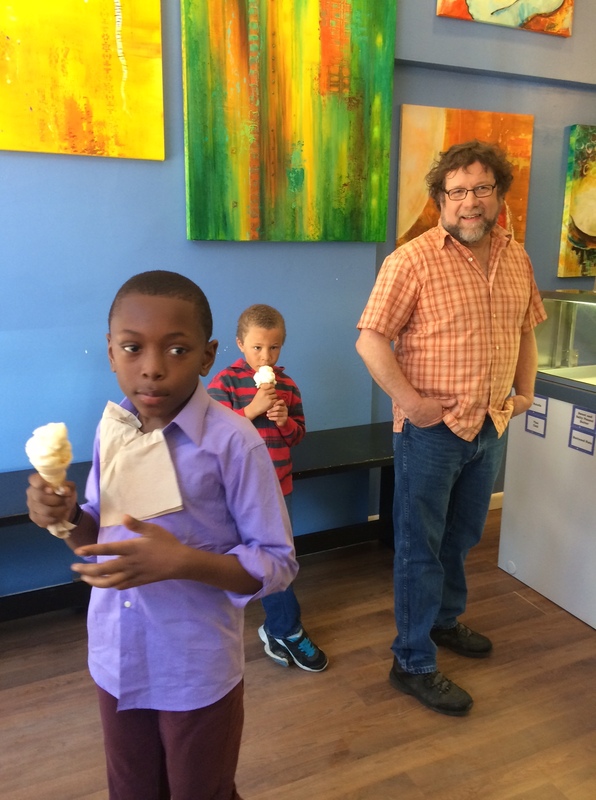 Have you been wrestling with the ethics of transracial adoption? Are you considering a known donor conception? Are you already parenting, and needing a check-in on some new concerns about your child’s current or future educational setting? Are you and your partner having trouble talking to those closest to you about the unique needs your twentieth century family has in today’s world? Whatever you may be wondering- if I can I am here to help. Our first conversation is free. So reach out now and let’s explore how I can help you discover what your next step will be. Please go to my “Coaching and Consulting” tab to learn how to book our first conversation. Recently I went away to one of my favorite places in the world (so far) for a weekend with a single-mama friend to meditate, write, swim, laugh, and listen to God. I connect to my visionary spirit, and my soul in this healing spot that I’ve been coming to since I was seven. When I get quiet, and a respite from my parenting modality I return in a palpable way to what I know to be true. First is a deepening commitment to my sons feeling celebrated and accepted for exactly WHO THEY ARE today. (Middle school requires ferverent monitoring. Who are you-vs. who do you begin to believe your peers/teachers/ society or family says you SHOULD be.) This demands my being fully present, compassionate and flexible. Second I heard that I will return to my dream of creating a one woman performative event (monologue/story telling+poetry) celebrating and exposing my first fifty years on the planet, and the events and people who shaped it. Third, a new direction calls for my fifteen years as a transracial adoptive, biological, single and partnered parent. I will be unveilling this in more detail soon, but for the time-being it is already thrilling to announce it simply as a “Coming soon: Mama C Coaching and Consulting”. How can you help? If a particular post, conversation, article, or anything “Mama C” has been of help to you on your transracial/adoptive single or partnered/parenting/blending/ donor or other journey will you consider leaving me a comment I could use on my promotional materials? I look forward to hearing from you, and hope everyone can create a little quiet space for themselves in the near future. We arrived back in Maine around 10:00AM yesterday after the red-eye from Washington State Monday night. Leaving Sam’s family was all kinds of hard, for so many reasons. For me the hard was because my own visit with them was so short compared to last year. I dropped so easily back into flow with his mom, his grandmother and his sibs that I felt cheated from the brevity of the one and a half day visit this time. I also wanted every opportunity to see Sammy in his new flow with them with me there. Of course it is going to be immediately different once I show up, as evidenced by the “Instagram Live” broadcast from inside the car with his brothers and cousins on their way to shoot hoops mid week. (Talk about being allowed insight into a world you are not part of!) Finally, due to the dramatically declining health of his grandfather, there was a layer to this the leaving that felt very very hard. Not only is he very ill, but the care-taking demands on his Nahnah were exhaustive. I so wanted to be there to help her in ways that I am equipped and able to do. When I asked Sam if he was sad about leaving he said that he was fine. When pushed a little bit, he said that he got what he needed from the trip. I could go on and on about what I think that means, but that is not my place. Sammy gets to take that one out and unpack it in his memoir one day. What I can tell you is that he stayed up till 4:00am every night in a room with three boys who claim him as their own. He never opened the new toothbrush I put in his back pack. As in still in the packaging! Leaving California was another kind of hard. Until I have had more time to integrate that into my experience of being back on the East Coast I need to hold off on saying too much here. I will say that being grounded and supported where I was staying by my dearest friend and Sam’s namesake Samantha was critical to my ability to stay healthy, focused, and in my body for the duration of the journey. From mediation, to long foggy walks, to laying on the bed and laughing and crying to eating home made soup I felt totally held. So when Marcel’s donor and family came to pick him up for their adventuring the day after we landed they came in and stayed at Samantha’s for an hour for coffee and bagels and ease. This was normalizing and perfect for everyone. Kids coming and going, many conversations happening at once. Samantha and Tree have known of each other for a decade, so their meeting was so important too. Marcel found his footing with his new one year old brother (pictured above, and yes there is some kind of resemblance) and his feels-like-a-half-brother as well. I felt as if I had known Tree’s wife (who we will just call “Gorgeous” here) for a lifetime within six seconds. It was Gorgeous who said; “this visit is energizing for all of our souls.” Indeed. Sending them all off for the day and a half was like sending your child to the favorite uncle and auntie for an overnight. Clearly we are sill trying to find the language for all of these new relationships. More on that soon. Leaving California was not immediately hard on Marcel, as he really missed his big brother, and was eager to meet Sam’s family too. (And as you can see above, he was quite a hit!) But clearly figuring out how to stay in deeper connect with all of the love he discovered is hugely important. That Marcel came back from his time with them, and his half day alone with Tree more eager than ever for the world to know him as a young Black man is important to mention. He is so deeply curious about how people see him and know him right now. What I keep telling Marcel is how important it is that he know himself first. Pretty much we checked that box as a big YES for all of us in the last week. One of my favorite parts of all of this, is that now is when we all get to really reap the benefits that this trip could begin to mean for all of us. We have just completed our cross country trip, and still hopeful to raise the expense of the airfare through crowd sourcing. We are only $200.00 away from that attainable $2100.00 reach! Will you please consider a $10.00 contribution? Each donation adds up and truly helps. Thank you!!!! Love what you read here? Are you a first time reader, or a long time fan? Do you look forward to opening the email announcing a new post? Has your own understanding of Open Adoption, transracial parenting, or known donor family connection shifted in a helpful way? If so will you please consider showing your support with a ten dollar fandom contribution? This allows me to be "paid" here, instead of needing to farm the stories out elsewhere. This will also help me keep Mama C add free and content full all year round! Bisous! Adoption is very often a story of disappearance and erasure. To not hold this truth from the very beginning of the adopted child’s journey can contribute to a harmful fantasy that may impact that child’s identity formation. In open adoption, a child may temporarily disappear from one family, and then reappear “magically” in another. But what happens when the child returns? How they are welcomed back and how space is created for them is something both families co-create. What will happen when they steps into a space that belongs to them, but that their family, extended family and community of origin did not know existed? The child could then experience invisibility in the very space they thought or fantasized that they would always belong. This could be an extremely painful realization. Integration of themselves at that moment is deeply layered and will take lots of time and facilitation. I am reunited with both my sons. We stayed the night in a little Airbnb with a view of that mountain. We have all shifted and measurable ways. We are all going to leave a part of ourselves on the West Coast when we return home tonight. I have so many thoughts to share here. But I wanted to get this out as perhaps a placeholder to return to. I am still Gathering a great deal of information about everything that’s happened in the last few days. It will probably take weeks and months if not years. In my next post I will include a series of pictures that I receive permission to share here. Thank you for all your love, prayers, consideration, messages, and support. Every moment of it has been felt. Soon Sammy Sammy will be flying across the country on his own to spend a few days alone with his family in Tacoma, Washington. I’m really curious and a little nervous about how this will shake out. He is closing in on 13, he is an old soul, the child has lived. But he is a child, still. He is a child moving between two mothers, two families, one love. He is journeying at a moment where the world feels volatile and unsafe. But his is the world he is entering into as a young adult. It is what he knows, what he must know. He is no longer that little in my arms. His will always be that little in my arms. I’m also so thankful that all of this is possible in every way. Marcel and I leave on our journey two days later to visit with his donor and family in California. (Knowing that I will be on the same coast as Sammy is going to bring us all ease I suspect.) I’m equally curious how this Marcel moment will unfold, and what new understanding Marcel will gain about who his radiant, beautiful poetic self is in this lifetime. He will hold his little brother, who just turned one. He will be with his donor and his donor’s family. He will be invited into a new layer of understanding about what the word “family” holds for him. I’m also so thankful that everyone involved is all about the YES in this moment too. The everyone includes my husband who has been holding the YES in his own way. I can not begin to imagine what his experience will be having us all across the country navigating this extended family foray away from him. (Of course he was invited to come, and would very much like to join us another time.) And, yes, part of this story began long before he came into our lives. One day we all hope that those markers will fade into the background, allowing this to just be a shared breath at any one moment of who we just are. A dear friend reminded me to reach out on the blog to readers encouraging them to contribute to the GoFundMe campaign. This recent self portrait represents who I have often wanted the world to see when they look at me: heroic, larger than life, capable, confident, and self reliant for starters. My convoluted sense of who I believed I needed everyone to think I was started to take shape almost exactly a decade ago as my journey to becoming a parent, on my own, began. I remember standing on the end of that very same dock asking the “Lady of the Lake” as I call her, if I was ready to become a parent on my own? I had come to this little cabin for a solo weekend in June 2004, with gobs of paperwork to complete to submit to the adoption agency the following week. I knew that this was the one place that I could listen truthfully to my own fears, and leave my doubts at the bottom of the lake if I decided to say yes. I had been coming here since I was seven. It is my spiritual home. I showed up at the lake with a little more than a change of clothes, a jar of instant coffee, and my favorite pen. In the plastic bag that I had bawled up in the bottom of my backpack was my secret: a full length fleece bear costume for an infant-size six to twelve months. By the end of the night, I would be dancing around the cabin in front of the fireplace rocking my imaginary child back and forth. I had placed a towel inside the onesie to give it some heft. I wanted to know what that little body would feel like in my arms. I was intoxicated with the possibility. Like Athena popping out of her father Zeus’s head in full armor and ready to go, my single mother persona emerged from the dock certain that I could prove to the world, I had what it took to be a stellar parent all by myself. I probably fell in love with my potential and my image of my single motherhood that night. I knew I was crazy to do this on my own. I just didn’t know how crazy. I imagined that it would be hard, and expensive, and lonely, and confusing too. But I also believed that I had mothering and loving to give to a child in a fierce way. My determination and commitment to make the transformation from single woman to single mother was in motion, and there was no turning back. Each time a friend or parent seemed the least bit questioning of my decision to adopt, I would get bigger, not smaller. I would smile wide, and offer them a chance to come help out when the baby arrived. I put together the crib by myself, and bought a big freezer for all the food I had asked my friends to make for me when the time came. I interviewed day care centers, and pediatricians. I read books, prayed, and sought out others who came before me. I had purpose. I was reinventing myself for a higher calling. I was ready. Becoming a mother was not something I did in partnership, like most do. Becoming a single mother meant that I didn’t need a partner. I convinced everyone, and especially me, that I was so capable, and so gigantic that I didn’t need a partner to do this. I had many close friends who made up our chosen family. At least three times a week friends arrived with meals, encouragement and open arms to hold Sammy while I got a shower, or a much needed run around the boulevard. As he grew, and our family grew to include Marcel my network grew too. I was parenting, blogging, teaching full time, working out, accepting interviews, and speaking engagements. I was all that. Once, I had a friend tell me in secret from the other side of the playground; “my husband is worried that if I spend too much time with you, I’ll start to think I’d be better off on my own…” I had to keep myself from agreeing, because I really did think her husband was probably right, and I liked the guy a lot. Daycare providers, teachers, doctors, parents, and coaches knew that I was flying solo, and that was just fine. With each successful milestone passed, I grew more and more into my role. So much so, that to an extent I was not Sam’s mom, or Marcel’s mom, I was “Catherine the single mother who makes it look easy…” I had a lot at stake at keeping up that image, but little to no understanding of what I was letting go of in the process: the chance to open my heart to a loving romantic partnership. Sure, I dated a few times in the last few years. I drew wonderful people towards me and the boys. But I had no business doing so. To say I wasn’t ready would be false. I was to busy celebrating my own daily accomplishments, and those of my kids. Every letter from the tooth fairy, or successful parent teacher conference and I deserved a gold star. I was amazing. Who could possibly add up. A week ago, Shrek and I went on an international adventure, alone, for three and half days. We dropped the boys off with Uncle and my father and his wife on a Thursday in Massachusetts and drove across the Canadian border the next morning. 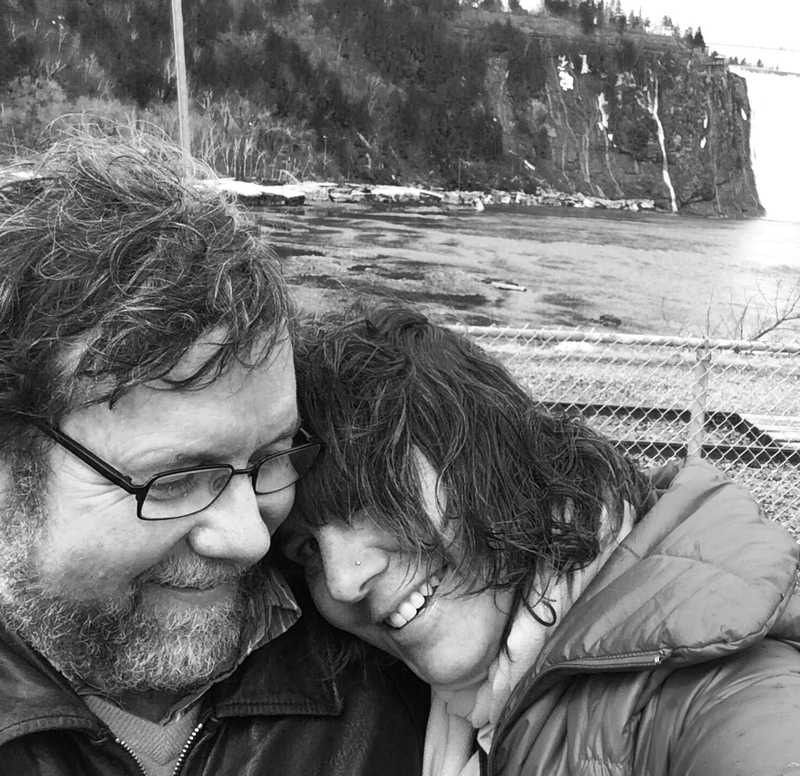 We spent three days and two nights in Quebec City. We had not spent more then one night together alone, without any of our seven kids in the entire two and half years we have been together. If you are trying to navigate the richly rewarding and intensely complex world of a blended family follow our lead and plan a get away trip as soon as you are able. If you have been with your honey since before the littles came onto the scene, I bet the same logic applies. 1. Being alone in your own house (for even one night) without the kids in the next room allows you to feel like a grown up in your own home. How you spend that time is up to you. We chose the station on the radio, and didn’t have to worry if the music was too loud after 8:30pm. A cuddle on the couch was not at risk of being interrupted. 2. Planning a trip without one whit of consideration about what we do with the kids once we got there, meant we didn’t really have to plan a thing! I checked out a book about Canada from the library the day before we left, because I could. I haven’t allowed myself that kind of “ease” or lack of planning in a decade. 3. A six hour road trip can be leisurely. You can have NPR on, lingering uninterrupted adult conversation and no prepared snacks. It does not include fear of dead gadget batteries, DVD players malfunctioning, or sudden panic struck forays into unknown strip malls for a public bathroom because I HAVE TO PEE RIGHT NOW MOMMY!!! 4. The car stays clean. 5. When you pass through customs, there is not confusion about if the kids are your kids, or his kids, or someone else’s kids. There are no letters or birth certificates to provide on demand, or explanations of what a donor is or isn’t, or why there is no father named on the birth certificate of the one you adopted or birthed. 6. At the hotel, you actually get to choose to sleep in the same bed as your husband, fiance, or partner. You do not have to promise to sleep next to one kid on one day, hold hands with the other the next, or give them all your pillows, and leave all the lights on to make sure they can go to sleep. 7. You can eat whatever, and whenever you want. You can be the quiet table. You can wander slowly in the streets afterwords, and be the sweet couple in the window of the bar where the local blues musician is playing some deep and slow wrap your heart around these notes rift that is wafting onto the cobble stone street. You can look into your honey’s eyes for an extended period of time, and realize you had no idea they were that green. 8. When it is raining out, you can still hold hands and walk along the river for several hours in a frightfully American looking parka that could be mistaken for a tent, and compose an entire poem in your head because you have space remember it. 9. A museum does not have to have the word children in it anywhere to be on your list of possible destinations. You can stroll through a gallery in a museum and actively loathe the painting you see, and not need to explain that while the artist may have been trying their best, you do not actually have to agree that it is worthy of an entire wall. You can sit in the cafe and eat all of the cookie you bought for yourself, or share some with your honey. You can linger in front of one image for twenty minutes, and even come back to it, and not have to thank the guard for helping you find your missing child, or be horrified when she asks you to leave because playing tag in front of the Degas is forbidden. You can put your head on your sweetheart’s shoulder while he talks about why they like a print, and notice that they are kind of sharp in a way you hadn’t noticed before. 10. After almost four days of uninterrupted time with your partner, you remember the sixty-two original reasons you fell in love with them, and add at least seventy-three more. In a way it feels like I finally met the man I have been waiting to fall in love with for the last two and half years. Or, I finally recognized in myself, a woman who was ready to deepen and deeply trust in this relationship. But, for me, this had to happen independent of parenting. I didn’t realize just how much more to us there could be when we finally created the chance to find out. Or maybe I was afraid that I wasn’t ready to show up as a partner, and a woman independent of my super woman single mom identity? That identity was formed long before Shrek came into the picture, so it was critical for me to get outside of that me, in order to lay down a solid foundation for loving Shrek as Shrek first, and then as Shrek the bonus dad, and father. What you might be thinking: Take away the necessity of caring for the kids and what will we discover? What if we don’t enjoy each others company when we are alone? What if we don’t know how? Is it a skill we could learn? I now in my case, it wasn’t until we were on the road, with passports in hand that I knew we were about to find out. Bottom line? I couldn’t be more happy that we did. Shoot location 1: the ice cream shop. Recently an editor at AARP magazine contacted me to see if we would be willing to be part of a photo shoot about the “Modern American Family”. After several emails back and forth, and lots of clarifying questions we agreed. The huge bonus here was the travel allowance to get four out of five of Shrek’s available children in town for the shoot. They came from as far as San Francisco, and as near as up the street for hair, make up, and click, click, snap, snap for a good part of last Sunday. as long as it complements the color of your shirt. The experience was a complete hoot really. (Leading up to it there was definitely some free floating anxiety about just how one is supposed to present as a modern family in the making…) But once we were all here there was some very sweet family bonding around the edges of it all. The photographers Gregg, and Tom, and Caitlin the glamorous make up artist or “groomer” were part of the blend by the time the shoot was complete. Five thousand tons of delicious food were delivered for our lunch and in six weeks or so the issue will appear. I was also interviewed over the phone for the story, and am super hopeful that a link to Mama C and the Boys might be included in the copy. Since the magazine boasts the largest readership in the world, it might mean a little boost in readership? For our “trouble” we will also receive a few prints from the day to mark this surprising and magical moment in time beautifully.